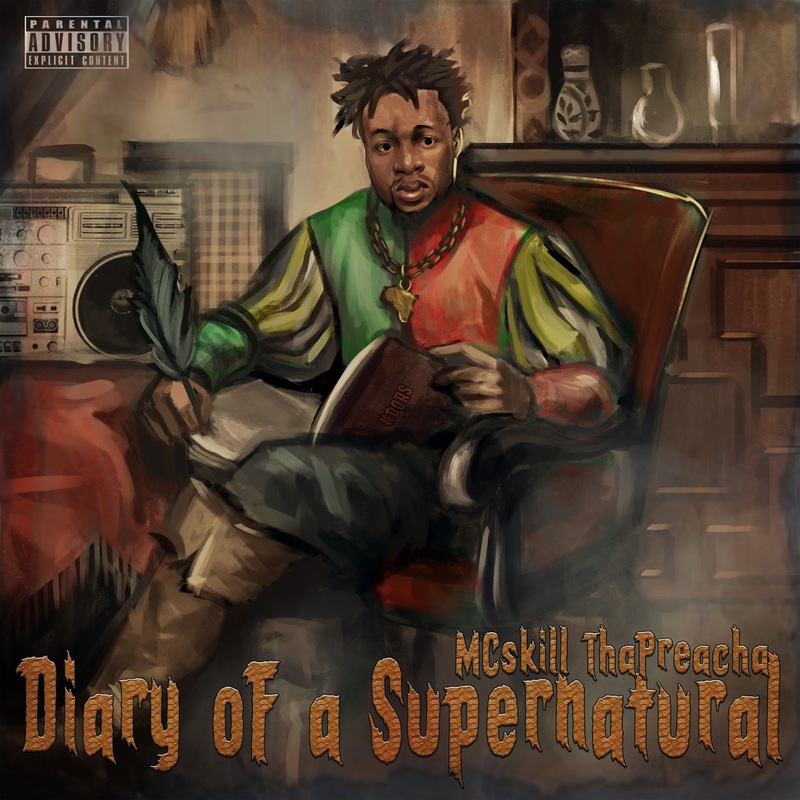 Home / Africa / REVIEW / Album Review: MCSkill ThaPreacha "Diary Of A Supernatural"
Album Review: MCSkill ThaPreacha "Diary Of A Supernatural"
MCSkill ThaPreacha's Diary Of A Supernatural album is simply A Diary - Filled with tales of Peace, upliftment, selfove and futuristic rhymes. The Nigerian rapper shares his thoughts and ideologies to the world. Like most socially aware rappers, MCSkill remains under the radar despite having a large catalog. You only get to know of his music when you dig deep into unchartered waters. I became aware of him early this year or late last year (not entirely sure), while i had my fears on if this was going to be another yawn-fest similar to the other projects I've had to go-through of late, he quickly puts my doubts to a halt with the lyrical onslaught that is Supernatural. I wasn't ready... I wasn't ready. "Diary Of A Supernatural" is the first full body of work I'm hearing from MCSkill which sort of makes it difficult to compare it with his other previous projects, but in terms of lyrical content this has to be up there with some of his best. I honestly wasn't sure of what to expect from "DOAS" but this is quite good. The album is high on substance with a delectable mix of values and culture. "DOAS" also has some of the good ol' braggadocios raps associated with hip hop artists. I always say every album/mixtape released is not for everybody and if some of the aforementioned is not up your alley then you may find "DOAS" a bit boring as the project largely caters to matured minds (lyrically) and those with underground yearnings. Sill, a few songs on it sound tailored for radio despite carrying deep contents. Songs like "Man In The Mirror," named after Michael Jackson's 1998 classic from the album "Bad," Celebration, In Love With You and Stay Shining make for good stand alone tracks. From the album's prelude (Dear Diary) featuring REZthaPoet to the closing track, The Season, Preacha keeps the theme consistent in major parts of the 20-track LP. One common downside with conscious albums is they start to get stale as you listen because the subject matter begins to sound repetitive, but that's not necessarily the case on DOAS. He manages to keep the listeners interested with vivid storytelling on each track without trying to sound like a broken record. Not straying too far from the conscious theme of the album, MCSkill pours his heart out to a past love on In Love With You (The Breakup). Over a sample of Barbara Mason's hit single "I'm in love with you," McSkill confesses his love to an unknown ex "I'm still in love with you/the whole fam loves you" he raps, he also talks about the flaws that led to their breakup. One track off the LP you may want to skip is "So Beautiful." I have no idea what he was trying to achieve on this but it sounds out of place and shouldn't have made the album. Catering to the ladies is one-thing but this record feels like a sleazy attempt at a commercial hit which he fails miserably at. Producers don't get enough credit for the efforts they put into creating Exceptional hip hop albums. Their input usually gets overlooked but we forget that they're to a large extent the reason our favorite MC was/is able to really flourish. Stormatique who masterminded the entire production process on DOAS is one of the reasons McSkill ThaPreacha was able to really shine lyrically (never underestimate the power of a good beat). The production he delivered on the LP is above most i have heard out of Nigeria in recent times. There's so much attention to detail, like the cry of a baby on Dear Daughter - a heartfelt ode he penned to his little girl 5 years ago to remind her of his undying love - The track is similar to Jay Z's Glory, you know, that song he recorded for Blue Ivy on the day of her birth. Diary is his 8th body of work and sometimes while listening I find myself wondering where I was when he dropped the other 7 projects. Before you start to judge me, I was focused on other things outside of hip-hop at the time - none of which included paying attention to Nigeria's underground hip hop scene. As good as the album may sound, did it really need 4 interludes? NOPE. Interludes have no business being in albums anymore, this isn't the 90's... GIOH. If an interlude/prelude or whatever should be added then it should never be more than two. The 4 on DOAS is just too much for me, I found myself skipping them each time despite each interlude being a little over a minute long. The choice of guest features on "Diary Of A Supernatural" is one area where I'll be doing a serious injustice if I don't give him credit for. A good song can become even better with the right choice of sparring partner and he fulfilled just that. A good example of my point is Black Child featuring Synik (he absolutely bodies his verse) both MCs deliver stellar verses on corruption, hope and the slave mentality of the black man. "When my people start bleaching/I can't even judge 'em cause they've seen overtime that when they light is when you love em." Black Child is one of the tracks I had to bring back a few times as there was just so much to dissect. While the rappity rap with A-Q on Stay Shining remix is good, the peak of the features remains Freeborn's soothing chorus on Man In The Mirror. My review of DOAS won't be complete if I fail to speak on the closing track The Season remix Featuring a plethora of rappers from different regions. The track produced by Stormatique with scratches from Teck-Zilla was released a year ago and still remains a certified headnodder. Originally slated for a 2014 release, "Diary Of A Supernatural" is a good conscious album with decent replay value. One that will be appreciated by die hard Skill fans and also newcomers like myself. Subject matter is at a high level which will only end up in making the album last longer. "So Beautiful," "My Way" and "Celebration" are arguable the album's only missteps, outside the interludes of course. Artists that always try to push boundaries should be applauded and McSkill ThaPreacha deserves one. DOAS is out now. You can support him by purchasing it on ITunes or other retailers you know. By @PapermanCH, an upcoming ghostwriter and part-time hater.